Technical Conference for professional software developers and engineers developing for the Android platform. 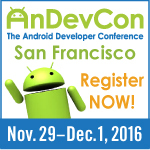 From mobile app development training to embedded Android and the Internet of Things, AnDevCon offers the most comprehensive program with countless sessions and networking opportunities. Roll-up your sleeves, dive into code, and implement what you learn immediately. To be held in Burlingame, November 29 – December 1. Register atwww.andevcon.com. Use code IEEE for a $200 discount off the three day pass.